Decide which modular services you need for holistic energy management in your company. Thanks to many years of experience in energy management, we have a comprehensive overview of the price and performance components of energy procurement in the electricity and heating market. Our team of experts analyses and compares energy prices, organises tenders and takes care of the commercial negotiation, processing and compliance with your supplier contracts. We take a close look at your energy bills and get a detailed overview of your costs. Because our experience shows that every fifth bill is still incorrect. In these cases we take care of the quick commercial clarification of the billing errors identified. We are your metering point operator and take over the installation and operation of measuring systems for you according to Meßstellenbetriebsgesetz (MsBG) (metering point operating law) as well as any sub-measurements. We take care of the reliable transmission of data so that you always have an overview of your company’s energy consumption with up-to-date data. 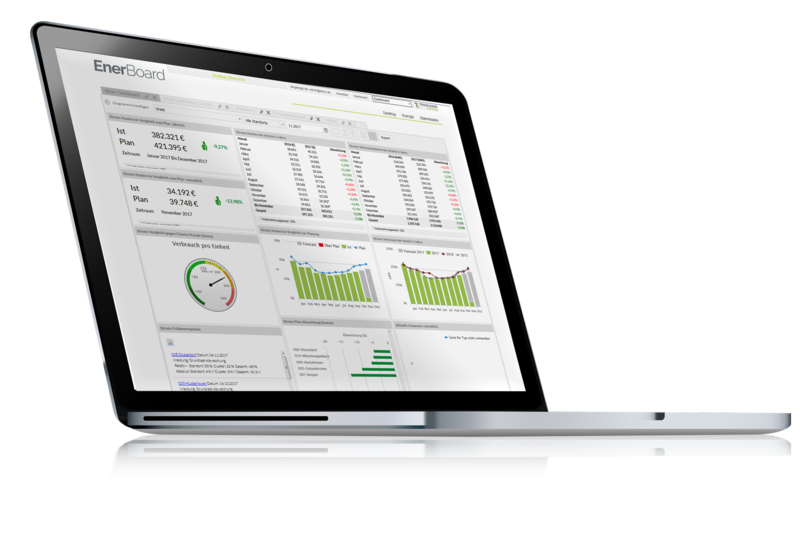 Using our innovative EnerBoard web platform, you can keep an overview of all energy costs and consumption across all locations and can also identify technical defects and potential savings quickly and precisely. With the clear presentation of the data delivered on a daily basis, we offer the opportunity for you to implement pioneering energy monitoring in your company. Our competent consulting team will answer your questions about efficient energy management. We not only offer you technical and business solutions, but also carry out energy audits in accordance with DIN EN 16247-1 or assist you with the introduction of the energy management system DIN EN ISO 50001.